Amphibians are animals with backbones and legs, and thin, usually moist, skins. All Saskatchewan species have gilled aquatic larvae, which metamorphose into terrestrial, lunged adults. 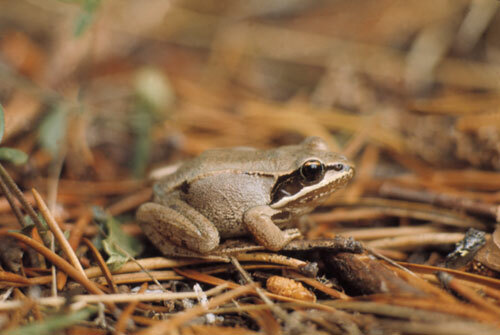 Amphibians are cold-tolerant, sometimes seen active below the ice on ponds, but are not dry-tolerant. All amphibians are Carnivores, feeding on arthropods and any small animal food they can find, including other amphibians. There are six anuran species. The Plains spadefoot and Great Plains toad are limited to the dry Prairies of the southwestern corner of the province. They breed in ponds, where the trilling calls of the males can be heard in the spring. As the ponds dry up, they dig down into the soil and stay inactive through dry periods. The other species are found in suitable habitats, from temporary sloughs in the prairies to small ponds in the boreal forest, in which they lay their eggs and the tadpoles can develop without predation from large fish. Some of the Saskatchewan amphibians, such as the northern leopard frog, are reduced in their distribution and numbers from earlier records. This reduction of amphibians is a world-wide phenomenon. A number of species, particularly of anurans, have recently disappeared. This loss in numbers has been blamed on several possible factors, such as increased ultraviolet radiation, the presence of parasites, the use of certain pesticides or the presence of exotic species, but no clearcut causes have been identified. Didiuk, A.B. “Amphibians and Reptiles.” Pp. 143-44 in Atlas of Saskatchewan. Saskatoon: University of Saskatchewan; Stebbins, Robert C. 2003. 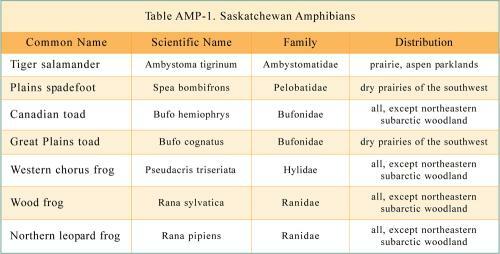 Peterson Field Guide to Western Reptiles and Amphibians. New York: Houghton Mifflin.